My goodness, how time passes! The days and nights have blended in to one in the last 3 months of new parenthood. Robin is wonderful and thriving, and we too, albeit a little bleary-eyed and flourishing in our new roles as Mum and Dad. Much has happened in these past few months, aside from growing a little person, I have fully fledged as a permaculture teacher working with the legendary and wonderful Patrick Whitefield. Teaching is something I have always felt drawn to, and I knew that all I needed was to find a subject I felt passionate enough about to enable me to take that path. It is a huge learning curve, and I feel that I learn as much from each lesson as the students do at this stage! But it is so rewarding, especially when I am approached between lessons by people who want to talk about what they have just learnt, and I see a spark becoming a flame - interest, enthusiasm, inspiration. Wonderful! This year was an extra challenge as I am breastfeeding Robin, so between lessons I had to dash out and feed him! Doug came with me to look after him during lessons and we all stayed in our campervan with the woodburner keeping us cosy through the night. Somehow, despite the feeding, hormones and broken nights, I managed to string enough sentences together to teach various topics from water conservation to open space technology....and have fun at the same time! My other major achievement in recent times has been the publication of my first book! 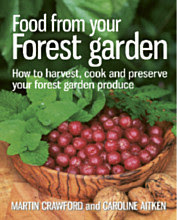 Food From Your Forest Garden is a seasonal guide to harvesting, cooking and preserving the crops form your forest garden. I teamed up with Martin Crawford of the Agroforestry Research Trust to follow up his comprehensive guide 'Creating a Forest Garden' with a practical, day-to-day cook book, which would enable people to incorporate unusual food into their daily diet. The book will be launched in May and is available to advance order from Green Books. I spent a lot of my pregnancy experimenting with weird and wonderful new vegetables, finding their flavours and complimentary combinations to create simple, easy recipes. When putting the effort in to raise crops, especially perennials which will be in your garden for several years, its important not to forget that you need to get in to the habit of eating them too! I hope this guide will help people to do that and enjoy the fruits of their labour. This experience has enabled Doug and I to discover which forest garden crops we really love, and which we would like in our own garden, and the book could also help readers to choose based on the descriptions of the vegetables. I hope people will find it a helpful book!